Another iPhone clone? 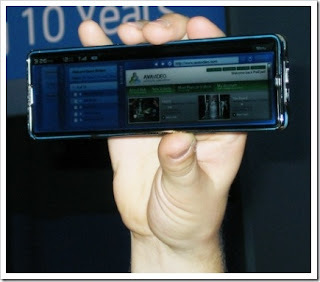 This device is designed by Intel and they are targetting to release the 1st version in the 1st half of 2008. The full internet experience in your pocket. The device is slim and looks slightly longer than the iPhone. Intel claims to be making some major transformation technologically to bring us the full internet experience. I m really not sure about what major transformation Intel is talking about and certainly have no clue why Intel is now interested in manufacturing a mobile phone. Intel is a great company and they should just focus what they do best with the processors unless if they have some good innovation that the world have not seen.